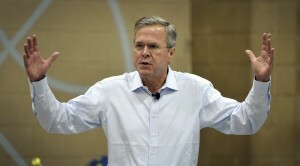 HENDERSON, Nev. — New gun control measures are not the way to prevent mass killings such as the shooting deaths of nine people in a South Carolina church, Republican presidential candidate Jeb Bush said Saturday. Bush, who plans to meet with black ministers in Charleston, South Carolina, on Monday, said identifying potentially violent people before they commit such crimes is a better approach than further restrictions on gun ownership. “We as a society better figure out how we identify these folks long before they feel compelled to take up a gun and kill innocent people,” the former Florida governor said at a town hall meeting. Afterward, he told reporters gun control was an issue that should be sorted out at the state level. “Rural areas are very different than big, teeming urban areas,” he said. The comments came less than a day after President Barack Obama eulogized one of the nine people shot to death June 17 at Emmanuel African Methodist Church in Charleston. During his remarks, Obama recalled episodes in Aurora, Colorado, and Newtown Connecticut, to again, suggest Americans seek tighter restrictions. Bush also told reporters that he was disappointed in both Supreme Court rulings from the last week that upheld President Obama’s health care overhaul and legalized gay marriage nationwide. He said he would repeal the health care law if elected, replacing it with high-deductible, low-premium catastrophic coverage. As for gay marriage, Bush said he believes in traditional marriage between a man and a woman but indicated he wouldn’t fight the court’s ruling. He said long-term loving relationships should be respected as well as a person’s ability to express their religious beliefs. This report was written by Kimberly Pierceall of the Associated Press.